We are coming to the close of another long weekend. The last one was for Easter and this time it’s Valborgsmässoafton on April 30th. It’s a song, speech, and bonfire-filled ringing in of spring named for Saint Walburga. And it flows right into the official red day (a red day is a national holiday) of Första maj (May 1st), the international worker’s day, which means closed stores and political speeches and demonstrations. So the way it falls on the calendar this year, many people have Monday and Tuesday off from work making for a lovely 4 day weekend. Saint Walburga was an English princess who served the Catholic church as a nun and abbess in Germany until her natural death on February 25th c. 777. Her feast days include February 25th when she died as well as May 1st when she was canonized. Although Valborgsmässoafton (VAHL-bohrgs-MEHS-soh-AFF-tuhn) is associated with her name, there doesn’t seem to be much religious connection beyond that. Whether it’s cold (nearly always) and rainy, or mild and sunny this is the moment that things change in Sweden. At least in southern Sweden. People tend to bust out the garden furniture and start to grill no matter what the temperature. This is also the day that signals the go-ahead for lighter, more summer-like clothing despite the fact it’s still pretty chilly. 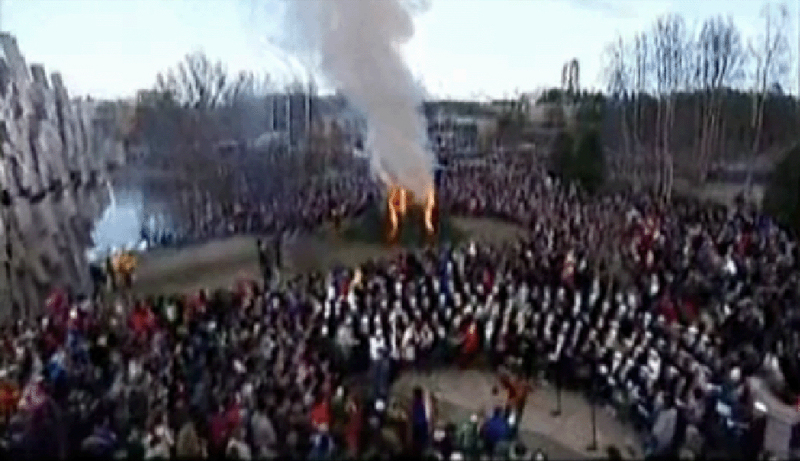 Bonfires are a common part of Valborg celebrations. Historically the fires were intended to scare off predators and evil spirits before the livestock were let out to pasture on May 1st after a long winter. In German tradition April 30th is also known as the eve when witches gather and bonfires were lit to hold them at bay. 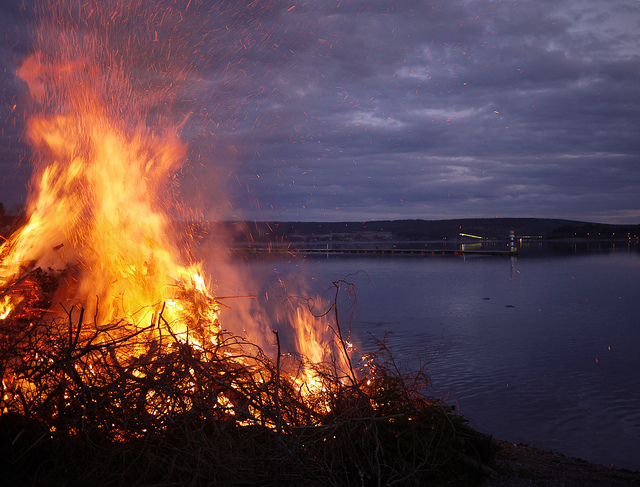 Many Swedish traditions are derived from Germany so witches are another possible reason for the bonfires. It wasn’t until the 1800s that the custom of the fires spread throughout the country. Valborg is particularly celebrated by university students with a traditional herring breakfast accompanied by snaps. Weather permitting, everyone takes to the parks for picnics, dancing and choral singing. Another part of the student tradition is to wear your graduation cap from high school and for everyone to put them on at a synchronized, precise moment. In the evening there are bonfires in communities all over Sweden and people bundle up to listen to a speech about welcoming spring followed by music, singing, and a bonfire. Standing next to a giant fire is generally a very good idea at this notoriously chilly celebration. Singing seems to be a common thread in Swedish celebrations and Valborgsmässoafton is no exception. One of the most well-known and loved songs for this holiday is Längten till Landet, more commonly known as Vintern Rasat Ut. The original lyrics are from a book called Jägarens Vila published in 1838 by author Herman Sätherberg and were set to music by Otto Lindblad in 1839. Although there are six verses the first two are most familiar to people and are traditionally sung by a men’s choir (click this link to hear the men’s choir version). An English translation of the first two verses is below. snow drifts melt down and die. The sun kisses life into the forest and lake. and in the grove dance källorne (the light streams and dances). waterfowl play around the bay and island. Since our kids are pretty little, I have only participated in the bonfire aspect of Valborg once. I remember it was cold and crowded, but charming. And now that I’ve lived in Sweden for four years I have really come to appreciate the excitement about spring. It’s merited. So as I climb into bed tonight I’ll be humming Vintern Rasat Ut (as I have for days) and waking up with renewed excitement over spring in Sweden. Another great post. Thanks for the link to the chorus. I’m so glad you enjoyed it. We are having unusually nice weather for the even this year. Tonight we are headed to Lund to watch the student choir’s spring concert. We haven’t done that before so it will be fun to try something new. And it’s a clear, blue sky today. Gorgeous. What I like about this (besides the stellar writing) is the lovely song that brings everyone’s minds back in touch with nature. I get the feeling that people in Sweden are always in touch with nature anyhow. I’m not sure why, but here in the U.S., news reports show May 1 events that involve protest, demonstration and sometimes violence. These events are not the norm, but it is representative of the disconnect here in the states with the wonder of Mother Earth. Then again, maybe it’s just the grass is always greener . . .
You flatter me yet again! My head may start to swell soon. 😉 Thank you again for such a nice comment. Eftersom jag följer din blogg och tycker om det du skriver, dina bilder och hur du på ett fantastiskt sätt “promotar” svensk mat och svenska traditioner med en mix av kultur och historia vill jag nominera dig till the Versatile Blogger Award. Jag har själv blivit nominerad (vilket tydligen = att man har fått den) av en bloggarvän och enligt reglerna ska man alltså nominera vidare. Kanske har du blivit nominerad tidigare och kan reglerna, annars får du läsa mer på http://versatilebloggeraward.wordpress.com/vba-rules/. Tack så jättemycket Meggie! I really appreciate your nomination and your kind words. I’ll do my best to get a new post up soon and to respond to the Versatile Blogger Award. It’s so nice to know you are enjoying the blog.